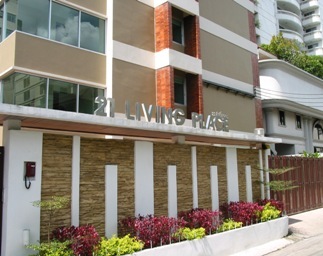 21 LIVING PLACE is a great place! I have been staying here two months now and I am actually the first person to stay in my room. Everything is new and very clean! On top of this the staff is very nice. The location is perfect. A 10 minute walk from the BTS Station at Victory Monument and only a couple of minutes to a nice park. A park that is great for running or just relaxing and getting a breath of fresh air. Something you need once and a while in Bangkok. Now a semi-permanent resident at 21 Livingplace. Professionally managed with modern stylish décor, excellent service and good security. Close to the BTS, restaurants, supermarkets, gyms, cinema and a nice park, it is a great location in central Bangkok. I will be happily staying here for a long time. With its modern facilities and very good security, it is a very nice and quite place with access to all amenities that you wish for when you live in Bangkok. Whether its restaurants, transport, shopping, entertainment or a stroll across the park in an evening every thing is available within minutes of this great place. I have been living here for over three months and I have no regrets making the choice to live at 21 Living place, I also had the privilege of occupying one of the studios brand new. The cleanliness is impeccable, with a team of dedicated and professional staff who ensures the premises are well cared for at all times. The management team, who are absolutely brilliant, ever so helpful and caring, never forgets to welcome you with a warm and friendly smile, a greeting that makes you feel you have come home. This is something very precious and dear when you live far away from home which I truly value and admire. I intend to stay in Bangkok for a long time to come, 21 Living Place is my choice of living and I can always call it home away from home. Bénéficiant d'un cadre agréable au calme d'une ruelle, vous apprécierez le confort spacieux et la propreté des appartements très bien agencés (lit king size, TV LCD, Internet WiFi,...) en toute sécurité. Sans oublier la gentillesse et le professionnalisme de la direction qui vous met de suite en confiance. J'y ai séjourné 3 mois, je pourrais y rester 3 ans ! As a former ex-pat of 4 years in Bangkok, I always found it difficult to find my friends places to stay while visiting me. No more need for that headache since I found 21 Livingplace and stayed there myself while visiting Bangkok as I'm a fan of apartment living, not hotel rooms. The building is spanking new as are the rooms as well. Friendly staff, professional security guards, remote controlled and automatic aircondition, self service laundry, spotless bathroom, sturdy safe, big fridge and a HUGE, comfy bed make living here easy. If you're looking for an oasis of tranquility in the hustle & bustle of down town Bangkok, this is your #1 option. The location is perfect with a mere 5 minute walk to the Victory monument Skytrain- station. Also Soi Rangnam is a hub for taxis so you can get a ride anywhere at any time of the day just by walking 50 meters to Soi Rangnam. There are several very nice restaurants in the immediate vicinity so you can have dinner close to home without going out on a night out in the city. I should know as I lived on that particular street for a few years. Last but most definitely NOT least... The staff are genuinely friendly and considerate and they are guaranteed to make your stay relaxed and convenient in every possible way. 21 Livingplace might not offer the most dazzling view over Bangkok, but it DEFINITELY is safe, convenient, friendly, modern and clean. That is all anyone needs while staying in Bangkok.